In September 2016, the federal government made an unparalleled investment in research and innovation, announcing $84 million in funding over seven years for McGill’s Healthy Brains for Healthy Lives initiative, as part of the Canada First Research Excellence Fund (CFREF) program. Following this announcement, a committee for the selection of the HBHL Managing Director engaged in an extensive search and interview process. The Chair of the Selection Committee, Vice-Principal Rosie Goldstein, is now pleased to announce the appointment of Dr. Ronald Lafrenière to the position of Managing Director, HBHL, effective February 20, 2017. With ultimate responsibility for the management and administration of the HBHL initiative and staff, Dr. Lafrenière will provide strategic operational leadership, support decision-making and peer-review processes, and oversee the development of new partnerships in service of the HBHL mission and vision. Reporting to Alan Evans, the Scientific Director of HBHL, and to the HBHL board, Dr. Lafrenière will also work closely with the Office of the Vice-Principal (Research and Innovation). Having received his PhD in Biology from McGill, Dr. Lafrenière returns to the University with strong academic and management credentials, gained in both the public and private sectors. Since 2013, he has served as a project manager at the Centre hospitalier de l’Université de Montréal (CHUM) Research Centre, during which time he has helped advance genomic research in Canada and internationally. He has also served as Coordinator and Scientific Advisor for the Réseau de Médecine Génétique Appliquée (RMGA) at the Centre hospitalier universitaire Ste-Justine since 2011. 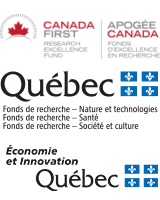 As Executive Director of the Centre of Excellence in Neuromics of Université de Montréal (CENUM) from 2008-2013, Dr. Lafrenière was responsible for establishing multidisciplinary research teams, for establishing collaborations between members of the Centre and collaborators in Quebec, Canada and abroad, as well as for coordinating the financing of large research projects. His experience in management of these, among other, large-scale research projects, as well as the biotech start-up company Emerillon Therapeutics, uniquely qualifies him to successfully steward the ambitious HBHL project to make McGill a global hub for brain research. Ever since Dr. Wilder Penfield founded the Montreal Neurological Institute in 1934, McGill has been at the forefront of neuroscience. HBHL will transform how we see and treat the brain, bringing new levels of insight to how we function in disease, in health, in our nuanced interactions with our environments, and as we change over our lifetimes. The goal of HBHL is to reduce the human and socio-economic burden of psychiatric and neurological illnesses (estimated at $22.7 billion annually in Canada), and improve the mental health, quality of life, and productivity of Canadians and people around the world for generations to come.